Former Reds star Steven Gerrard revealed that he is feeling the pressure of Liverpool's ongoing title chase with Manchester City in the English Premier League. Gerrard needs no introduction. He is one of the best midfielders in the history of England and remains one of Liverpool's legends. Gerrard scored a staggering 186 goals in 710 appearances for the Reds before he moved to the USA in 2015. His exploits against Milan in the historic Champions League Final comeback still remain fresh in the memories of avid football lovers. But Gerrard's biggest regret will be failing to win the Premier League title back in 2014, when his unfortunate slip helped Chelsea grab a 2-0 victory in the penultimate game of the season and arguably cost Liverpool the title. 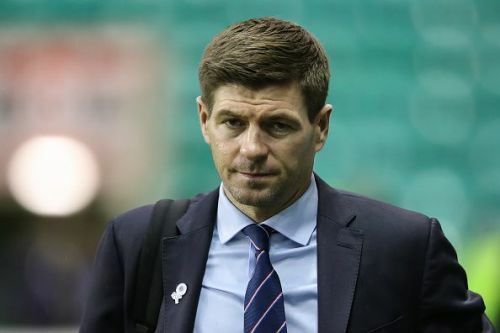 Gerrard is now the coach of Scottish team, Rangers but came back to Anfield to feature in a match between Liverpool Legends and AC Milan legends. The former Reds midfielder showed that class is permanent when he scored the winner for his side. Meanwhile, Liverpool are two points ahead of Manchester City in the Premier League, having played a game more than their closest rivals. The Liverpool icon spoke to reporters after the charity match at Anfield and claimed that he feels pressure regarding the current title race. Liverpool will face Tottenham and Southampton after the International break before they turn their focus to the Champions League clash against Porto.